A very exciting and productive week-end…..I now have 6 new starts. Each one 20″X30″. Let the painting begin!!! This entry was posted on Monday, March 9th, 2015 at 5:06 pm	and tagged with acrylic painting, art and posted in acrylic, Studio Time. You can follow any responses to this entry through the RSS 2.0 feed. I like the idea of doing more than one at once. I just tried doing three at a time, and they were small, but this is out of the stratosphere. Beautiful red, by the way. That furnace in the background is beautiful, too. I find that working on more than one at a time really keeps the energy flowing, and things I discover on one often carry over to the others. 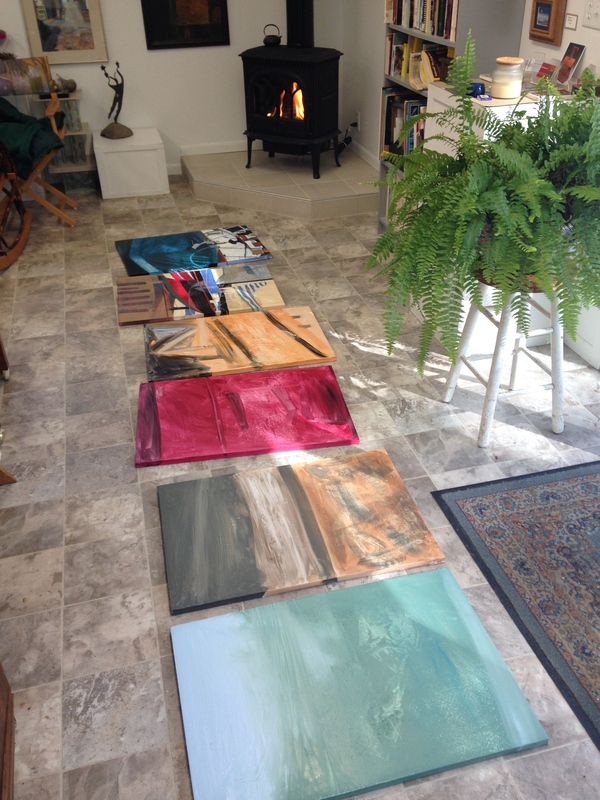 And when they are all done, even though each is different painting, there is usually a relationship between them all, creating a cohesive series. It’s a win-win. Thanks for replying. I only tried just this morning, and the paintings were planned at different times and look completely different, but the themes are quite similar. I found that it was time saving too, as I always use squeeze too much paint out and don’t want to waste it. I ended up doing some interesting things. Thanks again, and best wishes for the series. SB. Good point about not wasting paint….a plus I forgot to mention. And good luck on your 3 as well. I’ll look forward to seeing them posted when they’re done. Thank you so much. Two have been published and are sticky at present. Thank you.